The Round Lake Area Exchange Club Hometown Hero Committee is honored to announce U.S. Army SPC Cher Kolb-Wheeler as the March hero. This month’s sponsor is Dr. Connie Collins of the Round Lake Area School District 116. Cher was registered at the Clubs site, www.rlaexchange.org/hero, by friend, Sally Goodman of Gurnee.Cher is a Round Lake resident who is currently working on her MBA from Cardinal Stritch University. Before joining the Army Cher held numerous positions in the Greater Round Lake Area business community. In addition to chairing the Round Lake Area Chamber of Commerce Home and Business Expo, Cher also served on the Chambers Board of Directors. She is currently serving at Fort Sam Houston in San Antonio, Texas. “I was happy to see Cher’s registration come through and am proud that we can honor this homegrown hometown hero,” according to Sherry Ridge, the Hometown Hero Project Chair. The committee will be filling her “Hanging with the Heroes” care packages with beef jerky, crackers, chocolate and lots of candy to share, as well as a personalized “Hanging with the Heroes” shirt and letters from Round Lake Area School District 116 students. The Club will present a plaque on behalf of the March Hometown Hero at their March 23, meeting. The meeting is held at Panera Bread in Round Lake Beach, 7:30 a.m.
Any and all military personnel serving overseas or in the USA from any of the Round Lake Areas, Hainesville, Fox Lake or Ingleside qualify for the program. Five minutes will get them registered. If you have a neighbor, family member, friend, employee, employer, etc. 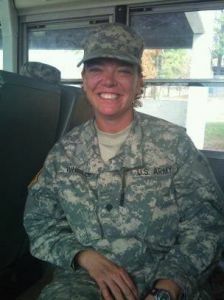 serving in the military please register them by going to www.rlaexchange.org/hero. We look forward to announcing the February Hometown Hero. For more information visit the web site or you can contact Sherry Ridge at 847-740-2379.